fara is raising money to support groundbreaking research to facilitate finding new treatments and a cure for Friedreich Ataxia. fara supports Friedreich Ataxia research projects in partnership with Friedreich Ataxia advocacy groups around the world, particularly the Friedreich’s Ataxia Research Alliance (FARA) in the United States. All of the funded research projects focus on advancing promising therapeutic approaches and they address strategic Friedreich Ataxia research areas. Improving clinical outcomes through the Friedreich Ataxia Global Patient Registry and the Collaborative Clinical Research Network (CCRN). fara does not accept research grant applications directly. Instead, we partner with FARA to co-fund grant applications that receive excellent reviews and are highly relevant to developing and advancing promising therapies for Friedreich ataxia. Gene therapy projects are of particular interest to us. To be considered for co-funding by fara, please submit your grant application according to the instructions on the FARA website (http://www.curefa.org/grant). All submitted applications are assessed by Bronya Keats who is the Chief Research Officer for both fara and FARA. Although clinical presentation and progression are variable in individuals with FRDA, a universal feature is ataxia and loss of motor control secondary to the significant neuropathology that typifies FRDA. Recent preclinical and post-mortem studies in FRDA indicate that sustained activation of immune-responsive cells in the brain – termed neuroinflammation – may represent one mechanism contributing to this progressive neuropathology. Using a novel combination of cutting-edge positron emission tomography (PET), magnetic resonance imaging (MRI), and blood plasma measures, this project will be the first to evaluate in vivo markers of neuroinflammation, and links between neuroinflammation and neurodegeneration, in individuals with FRDA. Identifying markers of neuroinflammation and uncovering the role that chronic neuroimmune responses play in driving or exacerbating neuropathology in FRDA will be key to improving the understanding of disease mechanisms, tracking disease progression, and identifying and monitoring novel treatment approaches. The goal of this project is to establish the world-first evidence-based speech therapy for FRDA, with participants to be recruited from Australia (Melbourne and Brisbane), Germany (Tübingen), France (Paris), and New Zealand (Auckland). Drs. Vogel and Synofzik have designed a home-based, intensive 4-week speech exercise program (one 45 minute session each day for 5 days per week) to evaluate the hypothesis that intensive speech rehabilitation using biofeedback will lead to improved speech intelligibility (i.e., ability to be understood) and vocal control in FRDA compared to existing care. The protocol is based on principles of motor learning and neuroplasticity, and involves computer based listening, visual and performance feedback and self-management. Participants will be assessed at 4 weeks (directly after intervention) and then at 3 and 6 months post intervention to measure maintenance of treatment effect. This study has the potential to change the landscape of clinical care for FRDA globally by establishing evidence for an intervention that significantly improves patient outcomes and can be rapidly translated into clinical practice. The aim of this study is to increase frataxin (FXN) levels by delivering the gene to the cells most sensitive to FXN deficiency: the central nervous system (CNS), sensory neurons, and the muscle of the heart using an inactivated virus called an adeno-associated virus (AAV). AAV-based gene therapies have been well tolerated in human clinical trials. In a prior study, researchers used an AAV virus to deliver FXN to a mouse model of FA and prevented and even reversed the heart abnormalities. Whether FXN gene delivery can likewise treat the ataxia and sensory aspects of FA at a relevant time point has not been tested because it has not been possible to deliver FXN throughout the young adult nervous system. To address this problem, Dr. Deverman recently engineered two new AAVs that enable, for the first time, efficient gene delivery to the CNS, peripheral nervous system and other organs, including the heart, from a single non-invasive intravenous injection. He hypothesizes that these new vectors will make it possible to increase FXN levels in the cells and organs most affected in FA. In the first year of this study, Dr. Deverman successfully developed AAVs that express FXN throughout the adult mouse brain, spinal cord and peripheral sensory neurons. Importantly, the vectors elevated FXN expression in the specific areas that degenerate in FA. His next step is to use the AAVs to augment FXN expression in a mouse model of FA. These experiments will test the efficiency and the safety of these novel AAV-FXN vehicles. These experiments will also test whether FXN delivery to the mouse nervous system can prevent or reverse behavioural and pathological changes caused by insufficient FXN expression. This last question is critical, as it is unclear whether neurodegenerative changes in FA that are present at the time of diagnosis are reversible through gene therapy. If successful, this work will support further toxicity and efficacy testing of these AAV-PHP:FXN vectors in preparation for human clinical trials. The dorsal root ganglia (DRG) consists of peripheral sensory neurons and is one of the primary and most significant sites of neurodegeneration occurring in Friedreich ataxia (FRDA). In this project we explored the feasibility of replacing mutated FXN cells within the DRG of the nervous system by transplanting human stem cell-derived neurons into the DRG region. This is based on our previous studies describing transplantation of neurons derived from FRDA stem cells into adult rodent cerebellar regions of the brain, showing ‘proof-of-concept’ that transplanted donor neurons are capable of partially integrating into adult nervous system. We developed a differentiation protocol that generates sensory neurons from human pluripotent stem cells (hPSCs) and demonstrated that both the control and FRDA hPSCs could be differentiated to multiple sensory neuronal sub-types, including proprioceptors, which are those most affected in FRDA. These findings are significant for using sensory neurons derived from FRDA stem cells for drug screening. This same differentiation protocol was applied to control and FRDA hPSCs to generate neural progenitors for transplantation into the adult rodent DRG. Our data shows successful targeting of donor cells both within and surrounding the DRG region following their transplantation. The donor cells generated multiple cell types, including neurons and glia, and some of the neurons showed expression of proteins consistent with sensory neurons. We are currently extending these studies to perform electrophysiology experiments in order to determine whether the donor neurons are functionally mature. These experiments are pioneering and highly significant for the fields of FRDA, cell transplantation and stem cell therapies. They provide promising supportfor the establishment of cell replacement therapies to treat neurodegeneration occurring within the peripheral sensory nervous system in FRDA. This study is providing vital information regarding the nature of heart involvement in FRDA and is identifyingpotentially important FRDA cardiac biomarkers for monitoring, prognosis, and clinical trials. Increased thickness of the heart walls is a common feature in FRDA, and is a predictor of symptomatic heart disease and premature mortality. This increase in wall thickness is likely to involve both loss of heart muscle cells and an increase in scar tissue. To examine this, the investigators are using a new cardiac magnetic resonance imaging (CMR) technique that shows promise in detecting early scarring in the heart muscle wall. They are also studying the relationship between heart changes in FRDA and one of the body’s natural hormonal systems (the renin-angiotensin-aldosterone system), which is known to play a role in other types of heart disease. Additionally, they are measuring a number of blood markers of heart function in individuals with and without FRDA, in order to understand the mechanisms that may contribute to the heart muscle changes. Several of these biomarkers are likely to be useful for monitoring and prognosis of cardiac disease, and have the potential to be highly beneficial in future FRDA clinical trials. Prof. Martin Delatycki and Dr. Louise Corben at the Murdoch Children’s Research Institute for their ongoing Friedreich Ataxia clinical research program. This funding provides support for Dr. Corben’s important efforts in facilitating and coordinating natural history studies of disease progression, leading to the identification and validation of clinical outcome measures and biomarkers that are essential for FA clinical trials. In addition, Dr. Corben studies many aspects of how Friedreich Ataxia affects people, including upper limb movement, cognition, participation in daily activities, sexual function and mental health, and she performs trials to determine the effectiveness of therapies for upper limb impairment, cognition and rehabilitation. The annual Friedreich Ataxia Scientific Symposium at which scientists from around the world present their latest research findings. The dedicated Friedreich Ataxia clinics in Melbourne and Brisbane. Patient and family information sessions held at locations around Australia each year. Participation of researchers in scientific meetings co-sponsored by fara around the world. Phase I: The treatment is tested in a small group of people to determine a safe dosage range and identify side effects. Phase II: The treatment is given to a larger group of people for further evaluation of its safety and to determine if it is effective. 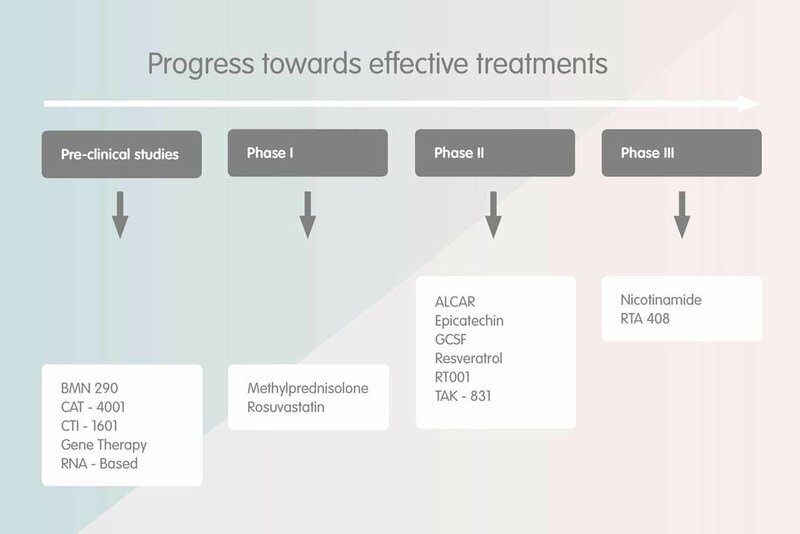 Phase III: The treatment is given to large groups of people to confirm its effectiveness, safety and side effects. Nicotinamide: This is a vitamin (B3) and HDAC inhibitor that has been shown to upregulate frataxin. Pilot clinical studies by Dr. Richard Festenstein were inconclusive. A two-year placebo-controlled, double-blinded clinical trial funded by the European Union (E-RARE 3 program) was announced in late 2017 with study sites in Germany, Spain, Austria, Italy and France. RTA 408 (omaveloxolone): Levels of Nrf2, a transcription factor that regulates cellular responses to oxidative stress, are low in FRDA cells. RTA 408 up-regulates Nrf2, which is a promising therapeutic approach. Initial results released in June 2017 were positive, identifying a safe and clinically active dose showing improvements in neurological function. The second stage of the trial (placebo-controlled, double-blind) is now enrolling 100 FA patients in the US (7 sites), Australia, and Austria. Sites in Europe and Brazil will open in early 2018. Estimated primary completion date is January 2020. ALCAR (Acetyl-L-Carnitine): Nutritional supplement (derivative of lysine, an amino acid made in the body) that is important in glucose metabolism and may be beneficial in cardiovascular disease and neurodegenerative disorders. This study is close to completion and results should be available by the second half of 2018. Epicatechin: An antioxidant found in many foods (cocoa, green tea, prune juice), which has been associated with numerous physiological benefits. The Mayo Clinic is running a 24-week open label pilot study to determine safety and efficacy (improvement in FARS and ventricular hypertrophy by cardiac MRI) in 10 patients. Resultsare expected in December 2018. GCSF: Granulocyte stimulating factor is a drug routinely given to bone marrow donors, which activates bone marrow stem cells and induces them to circulate around the body. Drs. Wilkins, Kemp and Scolding (University of Bristol) found that treating FA mice with GCSF increased frataxin levels and improved neurological function. Ataxia UK and FARA are providing funds to conduct a small pilot trial in FA patients at the University of Bristol. Preliminary results are expected by mid-2018. Resveratrol: This naturally occurring polyphenol, which is thought to have antioxidant and neuroprotectivebenefits, was shown to increase frataxin expression in FRDA cell and mouse models. A pilot study conducted by Dr. Delatycki suggested neurological improvement. Jupiter Orphan Therapeutics has developed a new formulation of resveratrol (JOTROL) in collaboration with Dr. Delatycki. Planning for a phase II trial is underway. RT001: dPUFAs (deuterated polyunsaturated fatty acids) have been shown to reduce oxidative stress and improve mitochondrial function in FRDA cell models. RT001 is a dPUFA developed by Retrotope. In a phase I trial, RT001 met the primary safety, tolerability and pharmacodynamics goals and suggested that the drug had a positive effect on the neurological rating scale, FARS. Planning is underway for a 6 month phase II trial. TAK-831: Takeda has developed TAK-831, a drug that may increase the level of the amino acid serine, which activates specific brain receptors thought to be important to motor functioning and signalling of neurons. Enrolment for this clinical trial is underway at 6 sites in the US. Results are expected in February 2019. Methylprednisolone: Dr. Lynch found that some FRDA patients, who were given steroids for another condition, had improved neurologic function. He has initiated recruitment for an open label pilot study with 10 patients to determine if anti-inflammatory steroid treatment is safe, well-tolerated and beneficial (improves FARS). All participant visits were completed in April 2018 and the data obtained for the primary and secondary outcome measures are now being analysed. Rosuvastatin (Crestor): ApoA-1, the main protein found in HDL cholesterol, is low in FRDA patients. Rosuvastatin (a statin used to treat high LDL cholesterol and prevent cardiovascular disease) inhibits the enzyme HMG-CoA reductase, which results in higher levels of HDL cholesterol. Dr. Lynch hypothesises that ApoA-1 levels will also be increased and has initiated recruitment for an open-label study with 10 patients receiving 10mg daily for 3 months. Results expected by the end of 2018. BMN 290 (HDAC inhibitor): BioMarin has identified a new generation of HDAC inhibitors compounds with significantly improved potency and brain exposure and reduced levels of harmful metabolites compared with RG2833. On 18 October 2017, BioMarin announced that BMN 290 has been selected as its next generation HDAC inhibitor to treat FA and expects to submit an Investigational New Drug (IND) application to the US FDA in the second half of 2018. Once FDA approval is obtained, Biomarin will be authorized to begin clinical studies of BMN 290 in human subjects. CTI-1601 (TAT-Frataxin): Chondrial Therapeutics (a company formed by Dr. Mark Payne) is pursuing development of TAT-Frataxin (CTI-1601), a compound designed to deliver frataxin protein to mitochondria in FRDA patients. The company secured up to $22.6m from Deerfield Management, an investment management firm with a focus on healthcare, to advance the clinical development of CTI-1601 and in August 2017 they announced that they have been granted Orphan Drug Designation by the US Food and Drug Administration. Gene Therapy: Drs. Barry Byrne and Manuela Corti at the University of Florida are making excellent progress with their FRDA gene therapy research program and are close to completing the studies necessary to file an IND application for a gene therapy clinical trial. In addition, several companies are pursuing gene therapy for FRDA, including Adverum Biotechnologies, PTC Therapeutics (formerly Agilis Biotherapeutics), Bamboo Therapeutics (Pfizer), and Voyager Therapeutics. In August 2016, Agilis announced that their gene therapy product candidate, AGIL-FA, had been granted Orphan Drug Designation by the US FDA as well as Orphan Medicinal product designation from the European Union, and PTC Therapeutics anticipates filing an IND application with the FDA in 2019. We are co-funding (with FARA US and FARA NZ) a grant to Dr. Ben Deverman to develop novel vectors for FRDA gene therapy. Voyager has partnered with Dr. Deverman to advance his vector technology. RNA based: Oligonucleotides that stabilize and increase FXN mRNA are being developed by Dr. David Corey at the University of Texas Southwestern in Dallas. Dr. Jonathan Watts (University of Massachussets Medical School) is working with Dr. Corey to test these synthetic oligonucleotides in FA mouse models. Novel, promising therapeutic candidates (that is, those that have not been approved for clinical use) must be thoroughly tested in animals for possible side effects and appropriate dosage and delivery before an Investigational New Drug (IND) application can be filed with the US Federal Drug Administration (FDA). The Australian Therapeutic Goods Administration (TGA) requires a similar application. These applications are typically hundreds of pages long, and must include all the details of the pre-clinical studies that have been done and the proposed studies in humans. The FDA and TGA scrutinize all of the information, which usually takes many months and may require revisions and resubmissions. If the application is approved, human trials may begin. Access to enough patients who fit the required inclusion and exclusion criteria. The equipment and lab testing facilities required for the study (biomarkers, clinical outcome measures). Promising international gene therapy research means that significant progress is being made towards initiating gene therapy clinical trials for Friedreich Ataxia. fara is committed to establishing gene therapy ‘Clinical Trial Readiness’ in Australia. fara hosts the annual Friedreich Ataxia Scientific Symposium in Melbourne, which brings together Australia’s leading Friedreich Ataxia researchers and promotes collaboration and communication within the research community. Click here to view the program for the 13th Annual Friedreich Ataxia Scientific Symposium.